David Harland, former head of UN Civil Affairs in BH, admitted today he was responsible for the creation of the myth that UNPROFOR was unable to determine who had fired the mortar shells that caused the Markale 2 massacre on 28 August 1995. Forty-three people were killed and seventy-five injured at the entrance to the Town Market in Sarajevo. Markale 2 is one of the 15 “illustrative examples” of the shelling campaign against Sarajevo listed in the indictment against the then commander of the VRS Sarajevo-Romanija Corps, General Dragomir Milosevic. 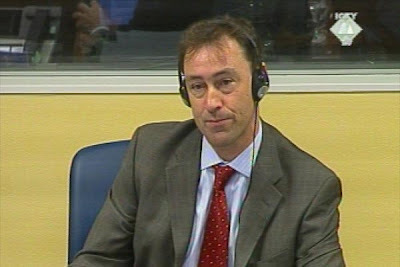 The myth that has survived for more than ten years, Harland said in response to Milosevic’s defense counsel Branislav Tapuskovic, was created because of a “neutral statement” made by General Rupert Smith, the UNPROFOR commander. On the day when the second attack on Markale happened, General Smith stated “it is unclear who fired the shells, although at that time he already had the technical report of UNPROFOR intelligence section, determining beyond reasonable doubt that they were fired from VRS positions at Lukavica”. Harland’s responsibility lies in the fact that he himself advised General Smith to make “a neutral statement in order not to alarm the Bosnian Serbs who would be alerted to the impending NATO air strikes against their positions had he pointed a finger at them”. That would have jeopardized the safety of UN troops in the territory under VRS control or on positions where they might have been vulnerable to retaliatory attacks by Serb forces. In his cross-examination Harland denied claims made by Tapuskovic, Belgrade attorney, that between two and three thousand Serbs had “been killed, had their throats slit and been thrown into Kazani” during the war in Sarajevo . Not denying the crimes committed against Serbs, and Bosniaks too, by Caco and his men, Harland categorically stated that “the huge majority of the Serbs killed in the town, inside the conflict lines, were killed by artillery and sniper fire originating from the positions of the VRS Sarajevo-Romanija Corps”. This line of cross-examination prompted Presiding Judge Robinson to ask the defense counsel “what is the point of this defense, even if the figures you’re presenting are correct”. In other words: “what impact will it have on the responsibility of General Milosevic for the crimes he is charged with”. Tapuskovic’s reply was that Caco’s crimes had engendered great fear among the Serbs that the same thing could happen to them if they were to be under Bosniak power. They therefore “held the positions around Sarajevo firmly”. While Tapuskovic claims that the Sarajevo Serbs “feared Caco more than bombs”, Harland believes that “the great majority of Serbs wanted to leave Sarajevo but couldn’t do so”. The reason why they wanted to leave town was “the siege and a great risk they ran of getting killed by shells or sniper fire from Serb positions”. Louis Fortain took the stand after David Harland. Fortain, a lieutenant-colonel in the Canadian Army, was UNPROFOR’s liaison officer with the Sarajevo-Romanija Corps. He was stationed in the Lukavica barracks.